I really expect something special from an advert nowadays. Be that print, radio or television, It’s irksome when I see the same BORING and PREDICTABLE content being churned out again and again. Of course there are certain standards that should be met regardless; good design, good copy, good use of space but there are a few extras that I think should simply make best practice. I want to FEEL something from an advert, that doesn’t necessary have to be a passion for the product or brand, but just a feeling in general. Humor is a great one but is often attempted through archaic stereotypes and terrible actors and tends to work best when it is a bit random and instantaneous, think the new Mercedes ‘Chicken’ advert. I believe adverts should always attempt to think outside the box, I think they should be responsive and relevant, they should tell a story and evoke an emotion. We often don’t need a product explained to us, we want to connect to the Brand selling the product. Adverts invade our personal space and lives everyday – so it’s only fair to have expectations. On the note of Emotive adverts I picked a few of my recent favorites which I feel have gone for an inspiring / emotional angle and all come together quite nicely! Enjoy and please share your all time favourite Ad campaigns in the comments below! You can imagine my delight when I Buzzfeed’d my way across this 15 minute beaut whilst enjoying some mid-afternoon online procrastination. It’s only the MOST WE’VE SEEN OF ACTUAL SEASON 4 FOOTAGE so far, plus some lovely and funny insight from the cast and crew themselves! Holy Moly. Excitement overload subsiding. Since dedicating the later half of 2013 to completing the Game of Thrones books I’ve been left with a Westeros shaped hole in my life. Judging by the five years it took Martin to complete the fifth volume A Dance with Dragons I’m not holding out hope for the sixth to grace my life anytime soon, so the return of the equally gripping HBO TV series is the perfect way to fight off withdrawal symptoms. Knowing what’s going to happen does not spoil the excellently crafted TV show it just makes me eager to see how they choose to bring the complex story threads to life. It makes you feel like your in a position of privilege and I’m sure this is a feeling I share with other fans of the novels. As for the exclusive video sneak peak: What do we find out? The beautiful Emilia Clarke who plays ultimate heroine and Mother of Dragons, Daenerys Targaryen, discusses the conflicts her character faces in the upcoming season as she struggles to rule over Meereen in the wake of her slavery revolt. It looks like we’re set to see more breathtaking scenery out this way (one clip shows the shadow of a rather larger wing span across Slavers bay which can only mean DRAGONS!) and of course in the snow blitzed unknown beyond the wall. PS Expect to find Jon Snow’s character quite changed as he returns to The Wall post Wildlings escapade. I’m delighted to say that Game of Thrones returns with its 4th season 6th April 2014! I think I share the opinions of many when I say that there were a few bad decisions made at Copenhagen Zoo over the weekend. When Bengt Hols, the scientific director for the Zoo, made the decision to destroy Marius the 18 month-old healthy giraffe, against a 25,000 worldwide-strong petition, a media frenzy obviously followed suit. I say destroy here because I believe ‘euthanize’ is not contextual. When I think of euthanasia I think of pain and suffering and the alleviation of such, not of a healthy animal being killed for having an undesirable gene pool. You can read more about the Zoo’s decision here, here and here, but in short the young giraffe, described as ‘surplus,’ was shot dead before being dissected in front of a crowd of children because he was not suitable for breeding due to a ‘well-represented’ gene pool. The decision to kill Marius sparked backlash and debate that quickly escalated globally. In the lead up to the demise of the Giraffe an online petition to save his life quickly collected over 25,000 signatures with outrage being exchanged and shared by the masses. More fuel was added to this inferno when Yorkshire Wildlife Park publicly offered to take in Marius and house him with their other male giraffes, including Marius’s brother who came over from Copenhagen in 2012. Now following the incident, firmly backed by the Zoo, Marius remains have been fed to the Zoo’s Lions and the public continue to rage. So why has this incident in particular sparked so much controversy? The culling of healthy animals happens daily and The Zoo defends its ultimate decision wholeheartedly, asking if this would really be the center of a media frenzy if it was a pig. Well no it wouldn’t but then it isn’t a pig, it’s a giraffe. The reality of the situation is that in this instance the public identified emotionally with the animal and whilst all animals should be considered equally they just aren’t. I really believe the problem here was not the reasons the Zoo claimed were behind the decision, but the way in which the whole thing was communicated. It is without doubt that the Copenhagen Zoo have a PR crisis on their hands now as they try to sedate a lot of people whose wishes they went against. The incident is still trending on Twitter worldwide more than 24 hours later with many calling for a boycott against Zoos as this opens up the wider debate about keeping and breeding animals in captivity. Whilst the Zoo is going for consistency in their belief and resolve behind the decision their means of communication have been poor. Deciding to dissect the creature that had captured the hearts of those petitioning to save it LIVE on video stream, in front of children, was probably not one their wisest moments. They quickly gave ammunition to the media in the form of graphic imagery and then continued to defend this poor decision making as educational. Yes just what I missed out on when I was nine years old, a baby giraffe being butchered two feet away. Damn my educational flaws! They have made a few halfhearted responses to the backlash via social media but damage control seems low on their list of priorities, as does sensitivity. Why should they listen to people in the first place? Because public opinion matters. Because the public are the people who pay to visit their Zoo. Because people care about animal welfare and it is a HUGE topic of controversy. This was an ordeal poorly executed (excuse the irony) from start to finish and it will be something I’ll watch closely over the next few days. It’s interesting to see how similar establishments, such as Dublin Zoo have already issued personal opinions in response to the incident. Meanwhile the Copenhagen Zoo’s Facebook page suffers a avalanche of bad reviews that will dent their online reputation for a long time to come as people share their outrage. The internet is not to be underestimated when people care, and the Copenhagen Zoo signed its Public Relations death wish when it put a name to that cute face. Sorry that this post is late! Bloody useless haha. 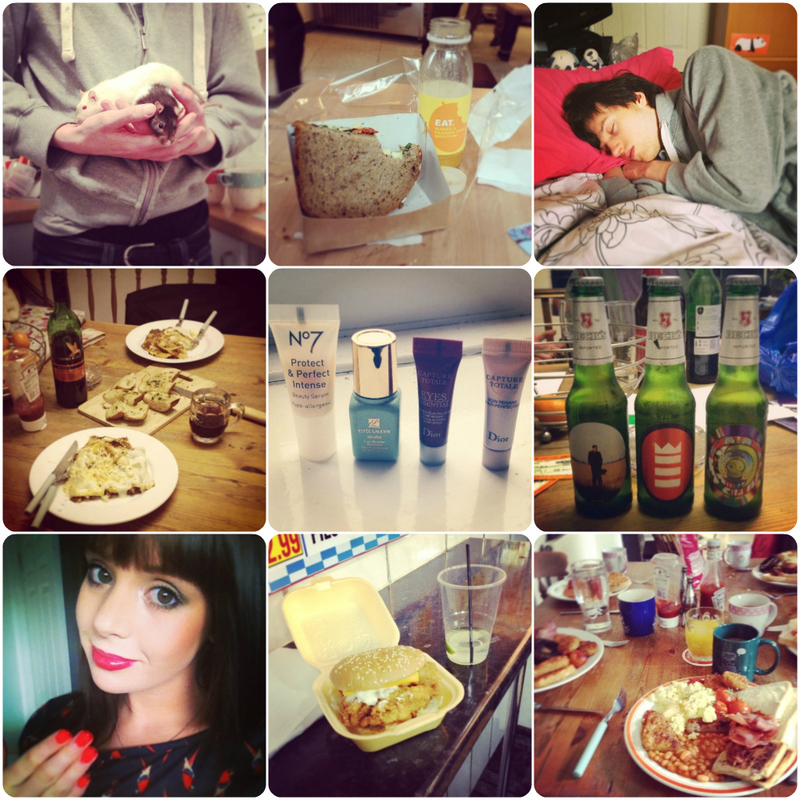 But without further ado here is my latest ramblings and happenings complete with Instagram best snaps of the week. Outfits & Nails: So I’ll work backwards and start with the weekend : ) I went for a couple of drinks with John’s housemates & friends on Friday night to New Cross. I wore a cropped tee shirt that I’ve had for ages. It’s navy blue with little bright parrots on, subtle but with a small pop of summer colour. It also has lovely scallop edges including the sleeves which makes it a bit more interesting for a casual evening outfit. I wore this with my super skinny jeans (the type you have to wiggle in to – but luckily they have an elastic waist instead of a button!) and brown, heeled trainers from River Island. 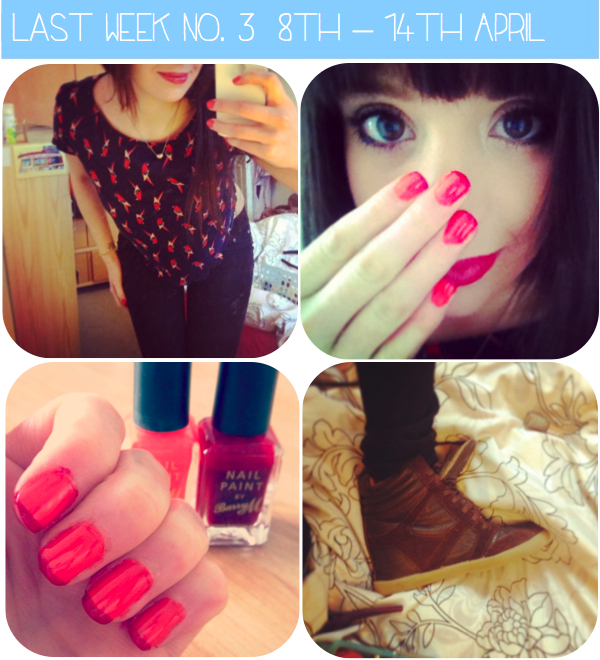 I wore red lips and painted my nails a deep coral with dark red tips (both Barry M). Samples: Collecting dust amongst my beauty products are numerous samples and freebies, those you tend to accumulate every time you get a nice shop assistant or in a beauty bag free when you spend a certain amount on a brand. These little mini versions are often overlooked, I tend to already have something else on the go so put them aside. But I dug them out the other day and I thought why not!? I’ve been using them all everyday for the last week so for their miniscule size they pack in quite a bit of product. I’ll get a full review up soon, but here’s what I’m trying out: No.7 Protect and Perfect Beauty Serum, Estee Lauder Idealist Skin Care Illuminator, Dior Capture Totale eye serum and eye cream. Sunday: On Sunday we walked in to Greenwich because the SUN was out, yep that long-lost friend of ours that’s been hibernating for, oh, only about 8 months!! It was a really nice day, had McDonalds, walked to the top of the hill which has a pretty good view over London and sat and drank some cider. The Market in Greenwich was pretty nice for a wander around, there were lots of unique patterned tops and crafty necklaces I’d have probably treated myself to if I’d had money! Sometimes I can’t believe how fast a week flies by! I’m starting a new temping job role next with as a Communication assistant for a Hotel brand. Wish me luck! It’s scheduled to last a few weeks but we’ll see! What have you been up to now the sun has surfaced?! Well better late than never! 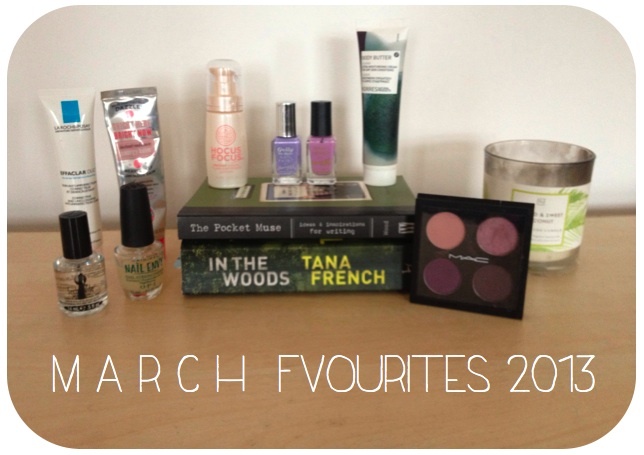 Here is a round up of products that have all brought something g o o d to my life during the bitter month of March 2013! As this is my first ‘favourites’ post I’m going to chuck in some mini reviews as well. As you probably know (I moan about it enough) I don’t have any money at the moment, it’s all going on bills and my flat, so (most of) these aren’t new products for me but still products that have worked a little magic lately. 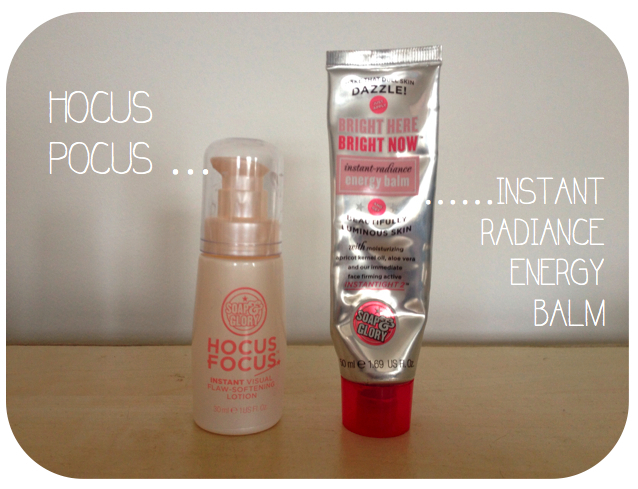 Soap & Glory’s ‘Instant visual flaw-softening’ Hocus Pocus works as a kind-of primer, kind of-highlighter, kind-of skin tone evener. I say ‘kind-of’ because it doesn’t really come across strongly as any of these. So why do I like it then?! Good question, I’ve always had a penchant for the S&G brand, I love their shower products, moisturisers, the floral fun scent they have going on and the packaging too. They are mid range price wise and in Boots there is a never ending 3 for 2 offer going on which makes stocking up cheap and easy. Even though I can’t pin down exactly why I enjoy using Hocus Pocus I’ve kept going back. This March it has been a life saver in brightening up my dull, red skin. I mix it with moisturiser and it gives a radiant finish. I’ve also opted a few times to mix it with foundation which makes my heavy coverage foundation (Nars Sheer Glow) a bit lighter and a bit brighter (yes, I don’t really find this foundation ‘bright’ despite the name, we’ll save that for another time!) Hocus Pocus comes in a dinky but heavy glass bottle that just screams quality. Another one from S&G, so same applies as above. Again it’s a radiance product and promises (as S&G tend to do a lot) BIG things, primarily ‘Beautifully luminous skin.’ I don’t think this balm lives up to all its claims, there is nothing particularly ‘instant’ about the benefits either. But then that’s the way it goes with beauty, it’s best just to blank out anything written by the brand itself and look at user reviews instead. What I will say about this is it is a great moisturiser for flagging and tired skin, whilst it doesn’t give me luminosity, it absorbs well and tackles dry areas, smells nice and has been a regular go-to for me in March. You will definitely have seen this product on the YouTube and Blogging circuit lately! I bought this after hearing rave reviews online from some trusted beauty gurus, It was accoladed as a skin-savior for blemishes, redness and pesky pores a bit more open than we’d like them to be. The consistency is not fragranced, quite watery (definitely not heavy or seemingly moisturisng) but surprisingly does not dry out skin at all. I’ve been using this for about five months and more often than not it is the only product I use after my cleanser. Which means it’s already ticking a lot of boxes, good moisturiser, good make up base. Sometimes I find a bit more product is needed than I’d like to cover all dry patches, but in these instances I’d suggest prepping with a beauty serum, mixing the Effaclar Duo with a moisturiser or following up after with one. In terms of results I can say without a doubt it has improved my blemishes, I have a more even skin tone, break out less and when I do get hormonal/stress spots (I never seem to be able to avoid these) they reduce and fade a lot quicker than before. I won’t stop using this little gem any time soon. This was a present that came as part of a set I got at Christmas and I have to say I’m majorly impressed. I’ve been using two Korres body products, this and the Body Milk: Coconut Milk. 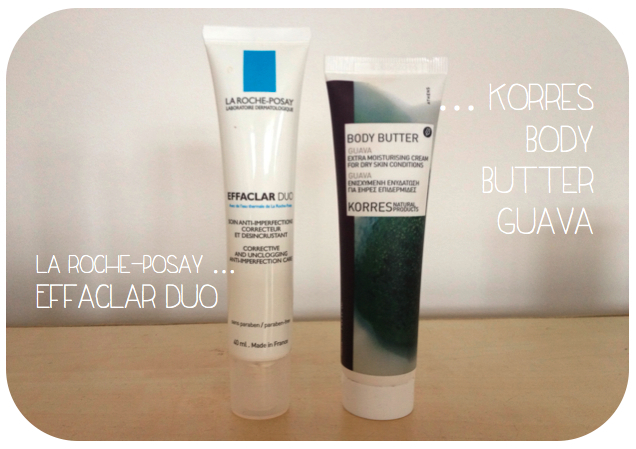 I find they both moisturise great and smell DELICIOUS. A fragrance that lingers as well so you feel fresh all day. I’ve picked the Guava body butter as my favourite this month because I think it just tops the other (it’s close), it’s a bit more of a heavy weight moisturiser so really tackles dry bits and lately my skin has needed this. I tend to use on my arms, elbows, neck and chest area and walk around feeling like I’m on holiday whenever I get a whiff! Recommended by my friend Daisy I purchased this off Ebay (worth checking out it was £9 compared to the £18 it goes for in Boots). I was desperate for any sort of nail saviour after suffering for a long time with short, brittle nails that can’t quite make it over the edge of my finger. I’ve mentioned this product in more depth h e r e but to cut a long story short this is a base coat nail product that has improved the condition of my nails dramatically! They are currently all sporting (small) white tips and are healthier looking than they ever were before March and the before the start of my love affair with Nail Envy. Another nail life save saver for me, this is the best top coat I’ve ever tried. Big claims?! Well I’m pretty darn impressed. I used to find my nail polish would be chipped to the point it looks tatty and I’d have to take it off almost instantly! I’m quite clumsy as well so find it hard not to ruin nails as soon as I’ve painted them. This little beaut flash dries nails and greatly improves the resistance of the polish. 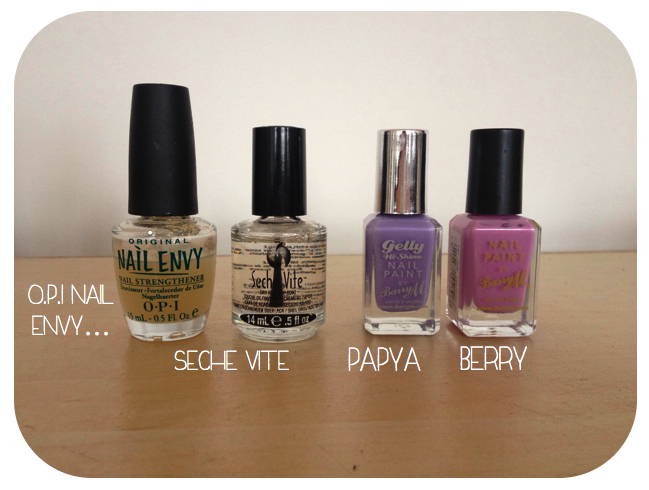 Pastels have been dominating the nail trends recently and I can’t get enough of lavender/lilac shades. I’ve been using Barry M Gelly Hi-Shine: Papya and Barry M: Berry. This was another steal off of ebay (£11 I think I paid) and is a cool toned, purple eye shadow quad. 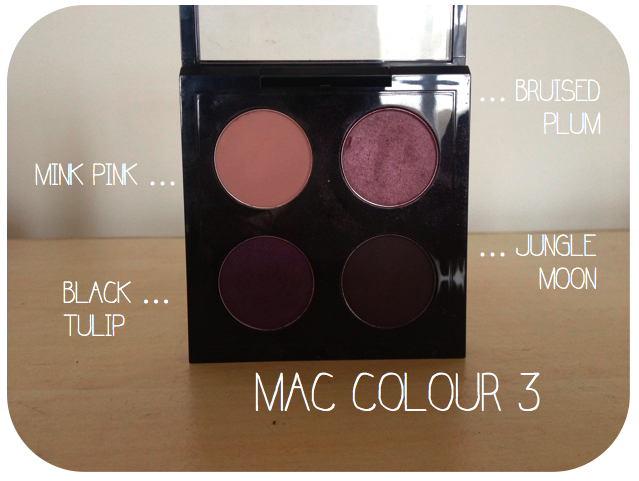 The shades are (from top left): Mink Pink, Brusied Plum, Black Tulip & Jungle Moon. Purple may not be everyone’s first choice of eye colour, I do usually tend to stick to my brown, beige and gold, But purple is a colour I think suits my skin tone and eye colour (hazel) and I couldn’t resist this well ranged palette that allows me to create a soft ‘barely-there’ hue of pink or build a dramatic smokey eye with Jungle Moon in the crease and along the lower lash line. I’ve been wearing this heaps during March, if you can’t find spring, you gotta bring it to you! At £4 you can’t go wrong, a delicious summery scent I’ve been burning a lot this month. Currently reading so can’t review just yet but enjoying so far! 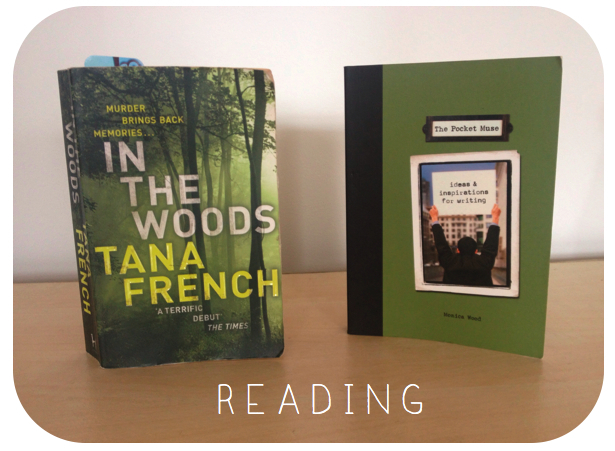 It’s been a while since I read a crime thriller and they are always good to get really engrossed in. This story focuses on a pair of detectives trying to solve the murder of a 12 year old girl, however protagonist Detective Adam Ryan must face some hidden memories from his own past and races against time to remember what happened when he was 12 when his two best friends disappeared. I’m about half way through so will let you know how that goes. I dug this little gem out of my book case recently, it gives ‘ideas and inspiration for writing.’ I bought this a few years ago to help me with my dissertation in which I created a series of short stories each based on a central motif. I was reading some blogs that featured a lot of creative writing and was thinking how I’d like to start a series of weekly creative fiction posts. This book is great at giving you scenarios to work off, beautifully presented with some great imagery inside it offers tips on writing, lets you read some fiction, and offers you a starting point – word, idea or question, on which to base your piece. You’ll see more of this book once I launch the weekly creative posts, watch this space! 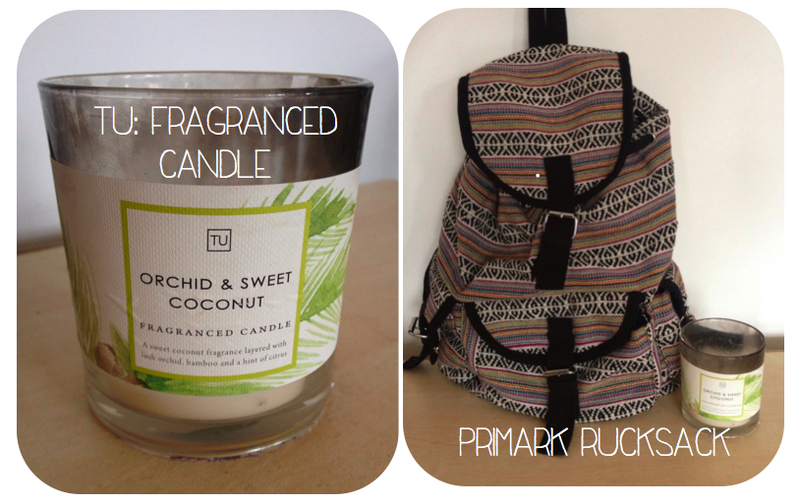 ♥ So they were the items that rocked my world more so than usual in March. So last night I received an email from the lovely Beca off of Those Moments of Serendipity nominating me for the Liebster Blog award… Lobster blog award?! I was intrigued! After a little bit of reading and research I found out that the Liebster (duh) Blog award is to give recognition to up and coming bloggers with 200 followers or less. It’s a tool of encouragement, not an ‘official’ award but a way of finding, sharing and communicating with blogs & bloggers you may not have been familiar with before, (how sweet!) I must say I’ve had a great time today just exploring Blog Lovin’ finding blogs in the furthest corners. I’ve read about peoples lives, seen photos and read poems. If this is not what sharing is about than I don’t know what is. 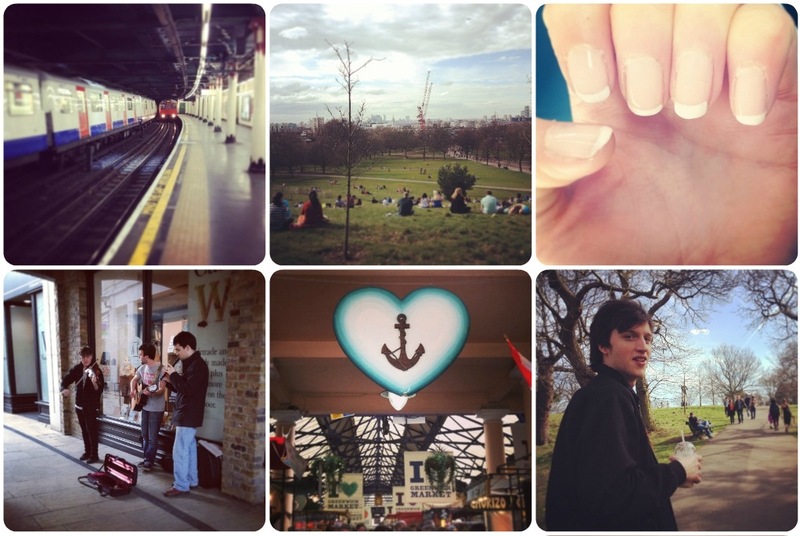 So without further ado I will jump in to the requirements of the Liebster Blog Nomination! I absolutely l o v e the way this works on a question and tagging system, not only does it give me some content to ramble on about but it connects me with other bloggers >.< and there’s nothing like a bit of networking to help boost a blogs morale (go us!) so if you find yourself tagged by me (you’re welcome) then it’s because I’ve found something special in your writing and I hope we can stay connected. What is your all time favorite product? Do you prefer Boots or Superdug? What do you do as a job? If you had to never use either makeup or hair products again (including shampoo!) which would you keep? Do you prefer pants of skirts? Do you prefer twitter or facebook? What is your favorite genre of movie? I did some hunting high and low to compile this blog list, I’ve picked a variety of different blogs, writers, poets, photographers, those that share thoughts and those that share beauty & style. It would be great if you went and had a gander at their sites, leave some comments and connect with the content, after all that’s what this award is about! The best place you’ve ever visited? When do you feel h a p p y? What are you most looking forward to right now? p.s Did you like my seal titles above? too cute! 24. 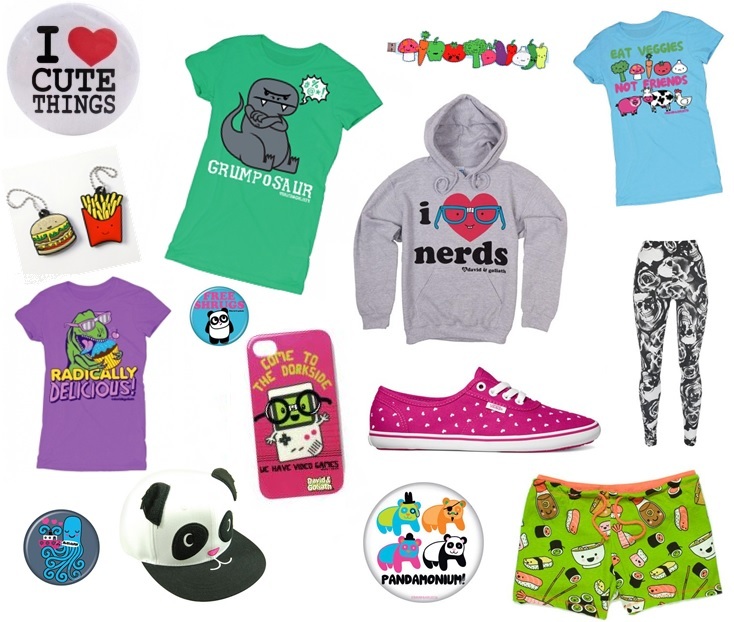 Panda obsessed. Cornish born. London dwelling. Wine drinker. Rat lover. Procrastinator. Writer.